Working in remote regions in ten countries, Tostan provides holistic, participatory classes in human rights, hygiene, health, literacy, and project management to adults and adolescents who have not had formal schooling. Using a unique approach, Tostan encourages the use of local rituals and customs, including plays, songs and dances to spread these teachings to the rest of the community. Since 1991 more than 200,000 people have participated in the programs, which have affected directly or indirectly more than two million people. 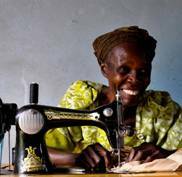 provides small loans of $50 to $150 to impoverished rural women in Uganda and Kenya. They use the money to start or expand their own small business which helps them pay for basic needs, education, and healthcare. Examples include growing and selling vegetables, tailoring, hair salons, and selling fuel efficient stoves. The collaborative nature of the communities helps ensure that loans are repaid on time at low rates of interest. To date, more than 500 loans have been made in more than 150 villages with a repayment rate of 100 percent! Aid for Africa is a unique alliance of U.S.-based charities and their African partners dedicated to helping children, families, and communities throughout Sub Saharan Africa. Our grassroots programs focus on health, education, economic development, arts & culture, conservation, and wildlife protection in Africa. In recent weeks Aid for Africa has reported through its website, in its blog, on Facebook and through Twitter many stories about the work of our members throughout Sub Saharan Africa. We highlight some of these stories below and hope that you will visit Aid for Africa to learn more. The illegal slaughter of African elephants is on the rise as demand for ivory grows in the Far East and China. In late July, the Kenyan Government burned $16 million worth of ivory to draw attention to the renewed threat to elephants. Wildlife Conservation Network, a partner in this effort, has been working with Kenyan-based Save the Elephants to increase elephant populations in Kenya for the last two decades. The world mourns the passing of Nobel Peace Prize Laureate and Green Belt Movement founder Professor Wangari Maathai on September 25. Professor Maathai left a legacy of empowering women by enabling them to become stewards of the environment. In 1959 Professor Maathai was one of only 300 Kenyans to receive a scholarship to college in the U.S. Writing in the Huffington Post about his fellow countrywoman, Michael Mungai said, “Looking at her, I saw what could be the future of Africa if the world invested in the education and empowerment of African girls.” The Aid for Africa Girls Education Fund is preparing girls to follow in Wangari Maathai’s footsteps. Thank You for Your Gifts to Aid for Africa! As 2011 draws to a close, thank you for remembering Aid for Africa in your personal and workplace giving plans. Your gifts change lives!